This second floor one bedroom/two bath condo offers views of the lush vegetation. Tastefully furnished and an active vacation rental. 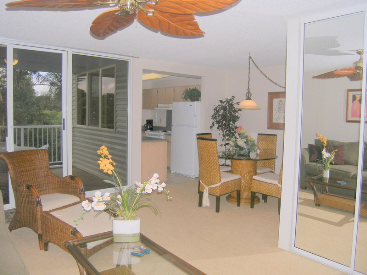 Enjoy 917 square feet and two covered lanais. A very spacious master bedroom suite. The Cliffs of Princeville amenities might be considered the best in Princeville with two swimming pools including a waterfall pool, two spas, two tennis courts, children's playground, recreation room, Volleyball Court, two shuffleboard courts, half-court Basketball Court, a putting green and Barbeque Grills.